I hope the night goes well for you, your family and your friends. It is a very lovely memorial, Brendan. Thanks, Marya. We have just been to the graveyard and placed it on the grave. Bitterly cold here. A pilgrimage and an act of the deepest love, Brendano ..
Greetings Brendano – this marker is resplendent, full of glory. I just love it to bits it is a wonderful testimony to his life. I shall toast you all later on when I am drinking up at the River with my brother and his wife – we shall be listening to some free jazz at the Queen Elizabeth Hall and then going for an Italian meal, and opening some wine. I hope there is a large measure of celebration for you all, no doubt some tears as well. It is beautiful and very fitting, Brendan. I hope this evening goes well; it will be a bitter-sweet experience but surrounded by friends and family, I’m sure it will be of comfort, and in a strange way, enjoyable I hope. 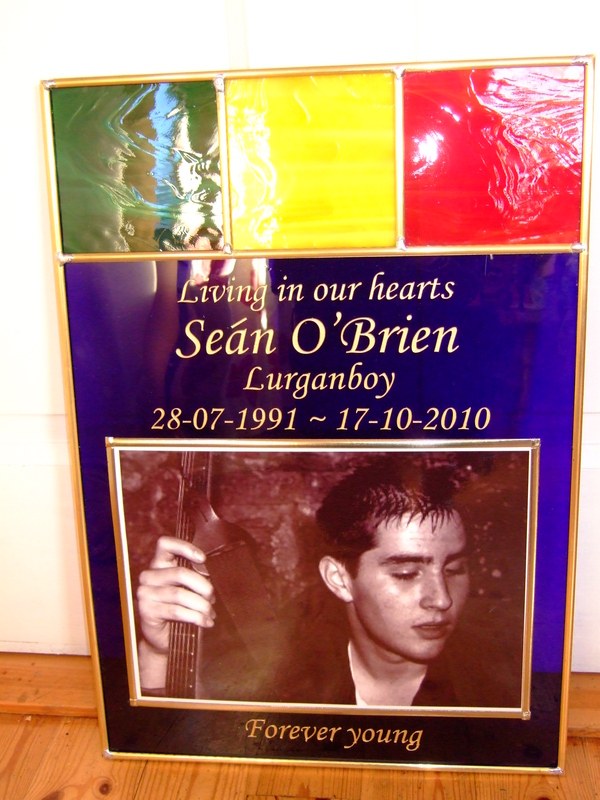 It is very nice design, Brendan, i hope you have had a good evening with your family and friends..God bless Sean’s soul. Lovely and intensely personal, Brendan. Family and friends like yours are everything at times like this. Best wishes. Thanks very much for the comments. We had a good night … first the church, then the pub till about midnight, where there was music (still going strong as we left), then some drinks and songs in the house, and to bed around 4. There are still a lot of people around this morning. Many of Sean’s friends were in the church and the pub. We continue to hear good things about him (there were some nice comments from a friend of his on this blog – https://brendano7.wordpress.com/2010/11/08/sean%E2%80%99s-music-1/ and https://brendano7.wordpress.com/2010/11/25/sean%E2%80%99s-world-4/ – yesterday). He was very good to his girlfriend and treated her well in many ways. She spoke about this to us last night, and also about the great respect he had for his parents. She is still very upset. Sean is a big, big loss. Good evening, Brendan … I hope each day continues to bring you fortitude and the blessings of friendship and grace to help you, Pauline, Susanna and Clio on this difficult journey. Thank you very much, Marya. Thanks, Aaron … I’m very glad. I hope that all of us who loved Sean will stick together and help each other. I know we will. The three of are watching the rugby here … it reminds me of Sean, but then everything reminds me of Sean. I remember you and he were in the car a few years ago, talking about the future, and you said with complete confidence ‘Sean is going to be a professional rugby player’. Yes most definitely we will, I have gathered everything I could find (Pictures and videos) of Sean and the gang, going back through the years, nest time I’m up your way I’l be sure to drop them in. It’s the same for me, he was such a huge part of my life, that the simplest thing like an can bring memories gushing back to me, but its not a bad thing at least we know he will always be with us this way. He had a real ‘nack’ for sport, especially Rugby, he could just throw himself into it completely with no reserve and in my mind because of that he was a great player and would of made a memorable Irish captain. Hello Aaron … thank you, that’s great; we’d love to see the pics and videos. I look forward to seeing you soon. Take care.